Dr. Allen was born in Dublin, Ireland. He went to veterinary school at the University College Dublin in 1985 and graduated in 1990 with honors. His father was an oral surgeon and his mother, a nurse. He has 2 older brothers, both doctors in Australia, and a younger sister who still lives in Ireland. Dr. Allen practiced as a small animal veterinarian in the small English town of Reigate, South of London, for a year before coming to the USA in July 1991 to complete a small animal internship at Michigan State University. Following this he pursued a combined small animal surgery residency and master’s degree at Purdue University. He met his wife, Lisa, who is also a veterinarian while at Purdue. He completed his residency in 1995 and became boarded in surgery the following year. 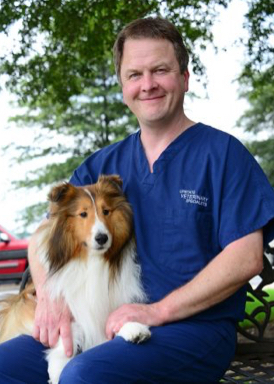 In 1998, after three years as a surgeon in a referral surgical practice north of Indianapolis, he joined Dr. Jevens in Greenville as a small animal surgeon and an owner. Dr, Allen has been with us since Upstate Vet was only 8 months old. Dr. Allen has two children, Andrew and Megan. When not working he enjoys traveling with his family, spending time at the lake boating, and flying various sizes of radio-control airplanes.